150GW unit is designed specifically for the Goldwing 1500 motorcycles. It plugs in-line with 4-pin harness connectors. It's slim enough to fit besides the headlight assembly. MAX power rating is 100 watts or 50 watts each bulb., which is sufficient for the stock 45W bulbs. DO NOT EXCEED! 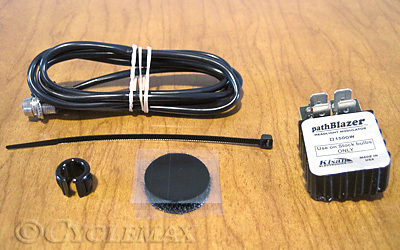 If you have 60/55 watt bulbs in your headlight, purchase the KIP115W-D modulator instead. That one will handle wattage up to 115 watts. If you have higher wattage bulbs, or you plan to use them in the future, it is advisable to use the P115W-D product to handle the extra load. BOTH headlight bulbs will modulate together as synchronized. Side-to-side (or wig-wag) flashing is reserved for Police or Emergency vehicle use only. 150GW circuit modulates the hi-beam current - from 100% ON to about 17% OFF. This is accomplished by using a p-channel MOSFET, which is inherently safe; the MOSFET is designed to fail in the ON state. For additional safety, the circuits DO NOT utilize the lo-beam whatsoever! 150GW comes with a detachable daylight sensor, which simply plugs into the pathBlazer. The daylight sensor functions as a switch; it stops modulation when it cannot see enough daylight. Since the internal circuitry is controlled by a microprocessor, it allows for customizable features. Software version v.820D allows two settings: High and Low. Software version v.823A allows 8 linear steps between the high and low end. pathBlazer uses a soft switching technique, which throttles the current flow through the bulb filament, so that there's no "thermal shock" - as opposed to a sudden inrush of current, which can damage the bulb filament or shorten it's life considerably. This is far superior than maintaining a small voltage!